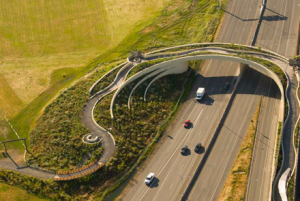 The Vancouver Land Bridge is a 40-foot-wide, 3,800-foot long paved trail that arcs across State Route 14. This bridge provides a vital pathway to pedestrians between the Renaissance Waterfront Trail along the shores of the Columbia River in downtown Vancouver and Fort Vancouver. The project was completed in 2008 by a partnership of the National Park Service, the City of Vancouver, the Washington State Department of Commerce, and the Washington State Department of Transportation. A full overview of the Vancouver Land Bridge project is available here (pdf).